We have noticed how much our readers like to use You Tube to watch videos on all aspects of DIY, Home Improvement, Tools and Building works and Avoiding Cowboy Builders. To celebrate this milestone we have a great give away on our competition page. Our sponsors Irwin, Milwaukee and Everbuild are kindly donating tools and products to give away to you, so simply answer the simple question for a chance to get a great DIY prize. 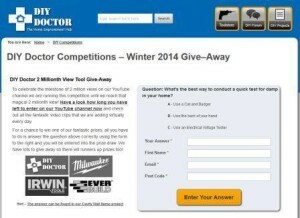 If you subscribe to DIY Doctor’s You Tube channel and you also sign up for our newsletters you become eligible to ‘Subscribe for a Prize‘ which is a free monthly prize draw with a chance to win tools, clothing and materials from our sponsors. You can also let DIY Doctor know if there is a video you want to see on any Home Improvement project or DIY skills that we haven’t yet featured. We are constantly adding new videos and How To Projects to our repertoire, but we love it when you let us know of a new tool or process to film. You can simply fill in our feedback form to let us know your suggestions.